My thoughts on Lincoln Riley at this point are pretty nuanced and hard to phrase in terms of “good” or “bad.” He has obvious offensive genius and while he was handed pocket rockets in terms of personnel and support staff on offense when he came to Norman, he also made the most of that hand. It’s pretty apparent that a Lincoln Riley-led team is going to be consistently good on offense. Riley also unquestionably raises the quality of the programs’ recruiting and while I have grave doubts about whether recruiting higher ranked defenders will fix OU’s problems on that side of the ball, it’s probably not going to hurt them and his push to aid the defense with that skill set is impressive. My questions about Riley center mostly around his hires, his cultural emphasis, and what that means for his ability to build a top to bottom program that consistently churns out nationally elite teams. Whenever I raise the “yeah but Mike Stoops is still the DC…” point the response I get from OU fans tends to be “yeah and Tim Beck is still OC at Texas!! !” Things are a little slow this time of year as we all try to glean what we can from practice reports and wait eagerly for the first game of the year so why not dive into a RRS staff breakdown? Which head man is building the stronger program? Lincoln Riley or Tom Herman? Obviously Herman has been at this for longer and at more stops but he’s also worked under some great offensive minds at HC like David Bailiff and Urban Meyer whereas Riley got out from under Mike Leach early in his career and was under defensive HCs at both ECU and Oklahoma. The pinnacle of each guys’ run as an offensive coordinator is pretty markedly different from one another. For Herman it was the 2014 season at Ohio State. They had an early setback against Virginia Tech when the Hokies ran out a 46 defense with what essentially amounted to zero coverage behind it and chewed up RS freshman J.T. Barrett and that offense. The Buckeyes recovered and ended up beating one of the big time Mark Dantonio/Pat Narduzzi Spartan defenses in a 49-37 shootout on the road on a Saturday night. Then they lost Barrett and had to plug in Cardale Jones just in time for a postseason stretch that pitted them against Wisconsin in the B1G title, Alabama in the semi-final, and then Oregon in the title game. Herman tweaked the offense around Jones’ skill set and the Buckeyes won by scores of 59-0, 42-35, and then 42-20. It was an amazing offense and an amazing job of coaching a unit that was starting over with lots of young OL (albeit, two of which would go on to become Rimington award winning centers) and began the year with the back-up QB after losing Braxton Miller to injury before turning to the third string guy for the postseason. Riley’s opus was the 2017 Oklahoma offense, which translated a senior Baker Mayfield and deep interior offense into one of the most dominant units in college football history. On the negative side, Herman has the 2017 Texas offense which lost both starting tackles, rotated QBs every other week due to injuries, and started freshman and third-stringers all over the unit. Riley’s black mark was that early stretch at ECU before Shane Carden took over AND got a year under his belt (he started in the lackluster but still decent 2012 season). 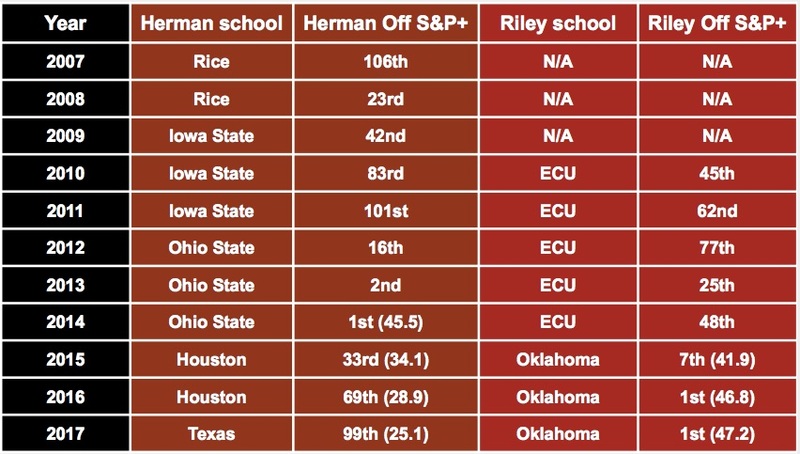 From someone who’s observed these two guys for years, I’d say that Herman’s strength has been building physical spread offenses that can grind and pound against even the best defenses whereas Riley has more of a flair for innovation. Most would give Riley the nod here and I may someday but it would be nice to see what he’d get up to without Baker Mayfield at the helm, or conversely what Herman would do with a generational talent like that. On the other hand, Tom Herman still has yet to build an elite offense without Urban Meyer looking over his shoulder. This is the big one for offensive-minded head coaches, how much attention and care they put into offering quality control and support for their defensive underlings. Herman has a multi-prong approach to helping his own defense be a major part of the program. The first is his offensive philosophy, which emphasizes physicality and toughness in the trenches so as to guarantee that his defenses have to face that in practice. You regularly see teams that are geared towards a finesse offensive philosophy struggle to simultaneously raise up defenses that are physical and tough when they face the stronger fronts on their schedule but defenses that are paired with a smashmouth offense are often some of the better units. That’s why defensive-minded head coaches often seek to protect their own side of the ball by installing boring, pro-style offensive systems. Secondly, Herman had a pretty strict vision that guided his one and only DC hire he’s made as a HC. He wanted a team that could run quarters coverages and blitz from a three-down front because he found that style to be the most difficult to handle as an offensive coach. His pal Dave Aranda led him to another guy in that school of defense in Todd Orlando and the two have been a dynamic pairing ever since. On top of that, after Iowa State’s 2-robber dime defense flustered Texas early in 2017 he directed Orlando to look into it and see what might be gleaned from that approach. That birthed the “lightning package” which dominated the second half of Texas’ schedule. Third, Tom Herman puts a lot of emphasis on his S&C program and maintaining an overall culture of physicality, toughness, and accountability. The first year at Texas was ripe with stories about guys being punished for failing to hydrate, the losers in offseason work being fed burnt breakfast, and grueling practices that didn’t shy away from contact and live tackling. Finally there’s recruiting and resource allocation, where Herman has never skimped out on behalf of his defense. He handed Todd Orlando Ed Oliver at Houston and last year brought in one of the highest rated DB classes in CFB history. Lincoln Riley has a much more complicated relationship with defense that is less developed but may have some major untapped potential. His big break in coaching came when Mike Leach’s only successful DC Ruffin McNeil took the ECU job and offered him a chance to be OC. The ECU defenses under McNeil were never particularly impressive and McNeil seemed disposed to give Riley the leeway he needed to run the Air Raid perhaps at the expense of his own side of the ball. He was rewarded for all that he did for Riley when Lincoln made him his first hire at OU after being made HC. We’ve never seen Riley guide the direction of the defense, seeming to mostly leave that to the Stoops’ brothers, but we have seen him act on behalf of his defense in a few ways. First, he either drove or at least approved a more physical practice regimen last fall in an effort to improve Oklahoma’s run defense and overall level of physicality. It didn’t really work at all but that was still a positive move from the HC on behalf of his defenders. Secondly, he’s never failed to leverage his strong recruiting ability to help bring in top talent for his defensive staff. We’ll see perhaps what kind of eye for talent he has but the services all agree that the guys he’s bringing into Norman are really useful. Finally, there’s his hires on defense. Riley inherited a defensive meeting room that was led by Mike Stoops but included a diverse collection of guys. On the DL he had Calvin Thibodeaux, a former Sooner who’d had a strong start to his coaching career and been brought in as a guy with familiarity with the Stoops’ brother systems. He added McNeil to that picture, giving OU two DL coaches for an ostensibly three-down team. That’s some bizarre resource allocation but it’s possible that McNeil has a voice in other realms of the defense as well. At LB the Sooners have Tim Kish, who’s Mike Stoops’ longtime ally dating back to the Arizona days. OU’s ILB play since Mike and Kish arrived has been a major area of concern while their OLB play has often been quite good. Then they’ve had former Notre Dame coach Kerry Cooks responsible for the entire secondary after shunting Mike down to the LBs and up to the booth after his famous sideline exchange with DB Julian Wilson while Bryce Petty was carving them up in Norman back in 2014. To this cocktail of confusion and crappy defense, Riley made the offseason decisions to keep Stoops at the helm while adding Kerry Cooks ally Bob Diaco as a consultant. Diaco is now infamous for running UCONN into the ground and then taking over at Nebraska last year and making a bad defense even worse while trying to blame his predecessor with false accusations. I think the odds of Diaco helping this situation in 2018 are only a shade better than the odds of Diaco trying to murder Mike with a wooden stake. Riley is still a young coach that doesn’t have a ton of experience trying to oversee the defensive side of the ball. What’s more he may either not have had the political capital to push Mike out yet or, more likely, he didn’t want to use it after coming within overtime of playing for the national title. Firing the coordinator on the opposite side of the ball is always a useful lifeboat for a coach and you don’t want to cash that in too early. On the other hand, bringing in Diaco and the way Riley has organized his defensive staff doesn’t lend just a ton of confidence that he’ll make a good hire and reorganize effectively when he inevitably tosses Mike overboard like Jonah. There’s a chance that Herman will someday lose Todd Orlando to a HC vacancy somewhere but he’ll probably do anything in his power to maintain Yancy McKnight at the head of his S&C staff. They worked together at Rice and Iowa State, the latter of which Herman plucked him from when he headed to Houston. Under McKnight, Texas has embraced a more modern and aggressive S&C program that produces big players that can thrive in a physical style of football. The numbers that have come out of Austin in numbers like weight added, squats, and power clean numbers have been unlike what Texas saw from previous staffs and closer to the numbers that you see from NFL players. A consistent mark of the Herman teams over the years, even the 2017 Longhorns who were fairly incompetent on offense, has been good conditioning and the ability to grind against top level opponents deep into the game. McKnight, like all good S&C coaches, is the enforcer for the culture. After initial pushback, he won over the team and was able to engrain the culture when the players realized that his methods and drive was yielding major strength gains. Oklahoma used to have a typical, old school S&C man and culture enforcer in Jerry Schmidt. He was generally into the typical practices of yelling at people, pushing athletes to their physical and mental limits, and turning out beefy players that were well prepared to engage in physical confrontations. It seems like Riley kinda encouraged him out and Jimbo Fisher snapped him up for his “spare no expense” A&M program. Then Riley went out and hired the S&C man he remembered working with back under Leach at Texas Tech in the 2000’s, Benny Wylie. As it happens, Wylie was the man Mack Brown brought aboard when he decided to rebuild and revitalize Texas after the 5-7 debacle in 2010. Wylie brought a higher emphasis on “conditioning” than “strength” and frustrated Texas’ coaching staff with a refusal to have players lift at high weights which they felt contributed to a lot of the injuries and lack of strength that Texas then demonstrated in the following years. There was also a lot of frustration about Wylie’s easy going nature in the midst of a program that was struggling to get the most out of their talent. He was shown the door with Mack Brown after the 2013 season and was working at a private training facility in Abilene Texas when Riley pulled him back into the college ranks this offseason. It’s possible that Wylie’s run at Texas was just a bad fit or something and that he’ll connect with the Sooner roster and get the most out of them, but that was certainly an iffy hire, particularly for a program at the level of Oklahoma. Overall my suspicion is that Riley absolutely desires to oversee a program that can churn out strong defense and hard-nosed teams but that A) He doesn’t necessarily know what that looks like since he’s never really seen it in his career and B) Like other Air Raid coaches he’d rather lean on his offense when push comes to shove. These two coaches are going to be butting heads in Dallas for the foreseeable future and we’ll get a lot of head to head results that will render most of my analysis superfluous. Texas and Oklahoma are both blue blood programs with major resources and a commitment to excellence and while Riley had a head start in molding his program, at least on offense, they’ll be caught up relatively soon. 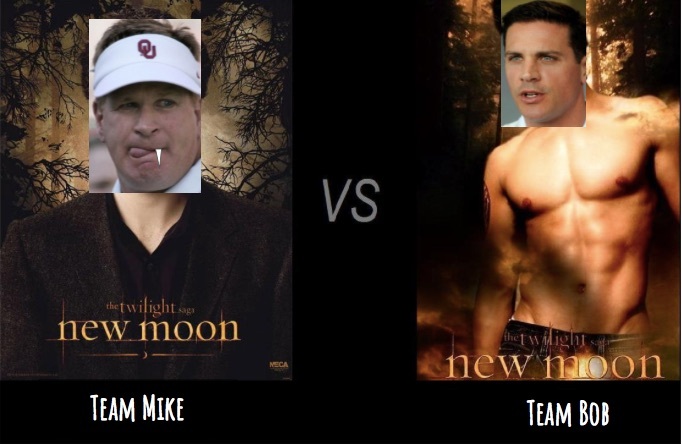 They have very different strengths and weaknesses then their two main predecessors (Bob Stoops and Mack Brown) and it’ll be fun to see how this battle shakes out. Given the tendency for the RRS to be a grueling street fight, I’m currently giving the nod to the HC with a track record for being a big part of building hard-nosed football teams. Depending on how you judge the scorecard, you could say it’s Riley 10-9 right now since OU barely staved off Texas in 2017. Or you could argue it’s Herman 10-8 and 10-9 through two rounds since his Houston squad clobbered Oklahoma in 2016 and a bad and young Texas team in 2017 went toe to toe with the Mayfield/playoff Sooners in 2017. 2018 should be an important round in this bout that helps define both the Riley and Herman era. Great articles like this one is why I keep reading your stuff. Excellent as always. Thoughtful and well structured analysis, I appreciate you answering my question with this level of insight. I think you have a lot of very fair critiques of the fledgling Riley era. The defense and culture are two things I am deeply concerned with moving forward. I actually think the culture will drive the defense and that is a concern with Wiley. It is fantastic to get great talent on defense but Caleb Kelly is currently a case study on talent must be developed and utilized appropriately. To some degree, Steven Parker and the maligned Jordan Thomas are both warnings of development gaps. We’ve done some stuff together before so I imagine that’s not out of the question. Maybe some podcasting. Caleb Kelly was just a bad fit at OLB in OU’s scheme. He’s not big and/or physical enough to line up and go toe to toe with really physical TE’s (case study: Kelly vs Blazevich, Rose Bowl 2018) and he’s not athletic enough to be used in the way OU had to use him due to their poor DB depth last year. That spot will probably be replaced by Bookie this year and hopefully will no longer be asked to set the edge in the run game. Kelly on the other hand should be a really good fit at ILB. His athleticism will be a plus there. As Boyd likes to point out, Beal was a pretty good athlete (running a 4.4 40) BUT he had a terrible shuttle time for an ILB (somewhere in the 4.7s) which is arguably more important for an ILB and tackling in space. The task Kelly faces inside is learning to read his keys while O-line are coming downhill at him. If he can get a decent handle on that quickly, I think he’ll be an improvement over Beal. Well, they can either move him inside and let him try a position where his skillset would be a really good fit or I guess they could just sit him on the bench because there’s a chance he wouldn’t work at ILB. The move is the right one, my concern is that it’s a year or two later than it should have been and also that they don’t know how to teach ILB anyways so he’s doomed regardless. I don’t really understand the dogging of hiring Diaco as an analyst. That’s all he is. He’s an analyst who has head coaching experience (even if he was a total failure) and runs a similar scheme to what Mike runs. That means he has more time to sit and analyze scheme and matchups and offer suggestions to Mike for coverage tweaks and/or new blitzes. If Riley, turns the keys over to Diaco after this season, then sure maybe we should talk about it being a boneheaded move. As it stands now, he’s just an analyst. He’s “added help” on the defensive side of the ball. If you’re going to criticize moves like that, you might as well say Alabama f*cked up by bringing in Butch Jones as analyst because he failed as a head coach. Butch Jones was a really good OL coach and recruiter, he just got promoted too high and maybe too quickly. Diaco was a mess at his last two stops and really ineffective in coaching spread D of late. The obvious tie-in for him at OU is that he’s worked with Kerry Cooks, which begs the question of what the internal staff politics and unity looks like on the defensive side of the ball. Best case scenario is that a dude with experience in the 3-4 defense can help Stoops and Kish better understand how the run D is supposed to work. That’s not really that bright of a scenario. He’s an analyst. That’s it. It doesn’t have to be any brighter than that. Butch Jones can’t even recruit as an analyst so that doesn’t even factor in. I think the article is clear enough on what kind of hire Diaco is and what that hire represents about the state of OU’s defense or how Riley will approach repairing it. You don’t think Saban picked Jones’ mind on recruiting? Of course he did, Saban is always looking to absorb insights. The article is clear on what YOU think the hire is. Diaco won the Broyles award AND coached a LBer who won basically every defensive award in 2012. He clearly brings something to the table as an analyst and that’s all he is. If you can’t see a guy like that bringing something to a coaching table but you think Butch Jones does, you clearly are looking at this through Orange shades. Especially when you’ve made such a big point about them needing ILB coaching help. Go look up Diaco’s record in defending spread run games and consider what input he needs to offer to OU to help them out. Go look up Jones’ resume as an offensive mind and consider what level of input he needs to offer on Bama’s behalf. It’s possible they don’t know how to teach ILB. They taught Dom Alexander ( a safety in HS) and Jordan Evans (a DE/OLB in HS) how to play ILB to a pretty high level. Their next protege wouldve been Tay Evans who had to retire and forced Beal a JUCO 34 OLB to move inside and learn how to play. He was decent at best. Kenneth Murray was a true freshman last year who had his bumps, as was to be expected. This year will be the true tell of whether or not Kish can teach good ILB play. I’ve been watching OU struggle with spread run game for many, many years now. They haven’t had a tandem as good as the Wort-Lewis combo in 2011 ever since Mike came back and brought Kish. The numbers and film on OU’s run D over the last several years is indisputable. Aside from 2012 when they basically ditched ILB altogether by the end of the season, they’ve only had 2 seasons where they had two experienced ILB. 2014 (top 10 raw YPG rushing and top 20 rushing S&P+) and 2015 (another top 25 rushing S&P defense). Every other year, they had to deal with the situations listed above. How’d those 2014 and 2015 OU defenses perform against good spread running teams? Amazing, I bet? Good enough to be top 25 in S&P which you are always championing. In overall S&P+, yeah. But their run D against good run teams was bad, the pass-rush and secondary carried those Ds. I’ve watched the film on those teams. I lost interest when you call walk-on Baker Mayfield a generational talent, yet fail to mention Ezekiel Elliott’s 2014 season at OSU. Meanwhile giving Herman credit for developing a “physical” running game. LOL, there’s a lot missing in this take. “Go look up Diaco’s record in defending spread run games and consider what input he needs to offer to OU to help them out. Go look up Jones’ resume as an offensive mind and consider what level of input he needs to offer on Bama’s behalf. Considering he’s an analyst, he doesn’t have to help them out a ton. He’s an analyst that’s it. The same point I’ve been making the entire time. You’re trying to turn it into something its not so you can use it as a point against Riley. The same way you are trying to take a loss for Herman against Riley and turn it into a W for Herman because they played the game close with a terrible team. He’s indicative of the kinds of hires that Riley would make to help his defense, which is important. Riley had a terrible D in year one that cost OU a national championship. His move in the offseason was to hire an analyst that was friends with the DB coach and had been fired after a terrible run as a HC and a horrible year as a DC in Nebraska that was a clown show. He’s an analyst for now, if they need him to offer good analysis that’s iffy. If they need someone to come in and take over if Mike wets the bed they’ve got him. None of that is good or indicative of a particularly promising year ahead on D for OU or for future Riley moves on that side of the ball. The idea that Herman scored one on Riley in 2017 was that if you evaluate the coaching in the RRS, the Texas side got the better end of it since they came about as close as you can get to beating the eventual B12 title winner and playoff entry with a 7-6 team. There’s no question that Riley had more to work with in that game and OU almost lost. I’m going off of rushing defense S&P only. 2014 and 2015 teams were both top 25 rushing S&P defenses. The 2014 one was solid, not great. The 2015 one gave up 300+ rushing yards to Texas and Clemson and some pretty big days on the ground to some other B12 teams as well. The wheels came off in 2016 and 2017 was a smoldering tire fire. If you want to point to lack of depth then that just begs the question, how come Mike and Kish weren’t developing more options at ILB if that’s an area of strength for them? When did I say that’s an area of strength for them? in 2014, they literally had two scholarship inside linebackers backed up by walkons. 2015 depth was a little better but then just became a total mess leading to the situations I listed above. So how does this bolster your point that the OU staff is doing a good job of developing ILBs, again? No part of your comment requires a different response than my previous comment that you replied to. Its your own blog so you can say whatever BS you want on it. Not really, I’m just saying its your blog so you’re welcome to spout nonsense if you want. I said they might be terrible at teaching ILB but that the situations they’ve faced haven’t really allowed them to show how good they are or aren’t. If anything, coaching two players (Alexander and Evans) to first team all big 12 at the position who didn’t play linebacker in HS. I’d say that looks pretty good for them. Everyone has to do that. If OU has this bad a hit rate then it doesn’t say anything good about their ILB development. It doesn’t really say much in either direction about their hit rate. 2013 they signed Alexander and Evans who were both All big 12. 2014 they signed 2 ILB, one being the retired Tay Evans, the other being Curtis Bolton who would’ve played a big role last year but got hurt. 2015 they signed 1 ILB and he’s now playing DT. 2016 is when they signed Kelly, JMT and Jackson. All of those guys are still on the roster and still have a chance to make an impact. If anything it says that they basically decided they didn’t need to waste their energy on recruiting for a few seasons and it showed up on the field. Obviously their recruiting at ILB hasn’t been great and arguably neither has their development since none of the guys they’ve been trying to teach to play ILB the last few years have been good at it. These all feed each other. Do you think OU will be good at ILB in 2018, then? “Obviously their recruiting at ILB hasn’t been great and arguably neither has their development since none of the guys they’ve been trying to teach to play ILB the last few years have been good at it. These all feed each other. Well then, we have an area where we can compare then. I do not. Fair enough. I guess we’ll see in about 22 days. After watching the game yesterday, Ianaboyd’s take appears to be pretty spot-on. Texas physically dominated that game. Yancy McKnight is going to give Texas a big advantage for the foreseeable future.